Glass fiber reinforced concrete GRC (GFRC) is an excellent material for constructing canals and curtain channels for pipes and electrical wiring. 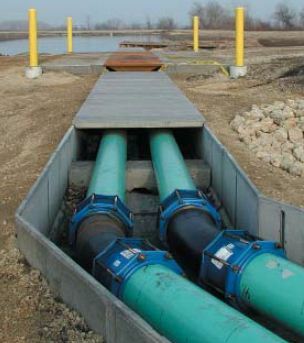 Creating protections of this type is often applied in difficult field conditions, where the threat to inflow of electricity, gas or water is appearing. Glass fiber reinforced concrete GRC is much lighter than traditional, thick-wall architectural and exposed concrete and because it is easy to transport, can be used almost anywhere. An additional advantage is quick installation and durability of the material. Ductile and several times thinner than traditional precast concrete, GRC concrete can be easily molded into any canals and curtain channels shapes. Another advantage is that this material is highly resistant to adverse and destructive external factors such as sun, frost and corrosion. It is also waterproof at level W-14, frost resistant at level F>250 and non-flammable, which is important when there is, for example, an electrical wire in the canal or curtain channel. These features cause that the material works as exposed concrete. 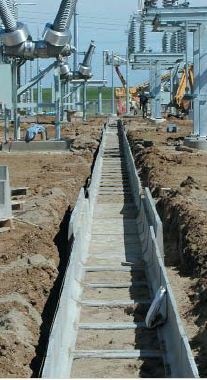 GRC ducts and containments are widely used in the electrical and power industries. 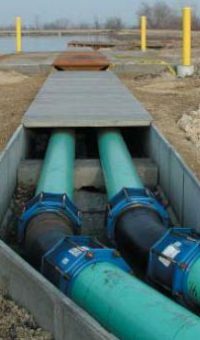 They protect the pipes and electrical wires against mechanical damage and the damaging effects of environmental factors. An additional advantage of choosing the cable ducts made of shielded concrete is their aesthetic appearance and the guarantee of the safety of people in the vicinity of the installation. GRC troughs ensure trouble–free operation of cable tracks even under severe environmental conditions (e.g. in mines, power plants or sewage treatment plants). Numerous approvals and CE certifications provide unsurpassed evidence of high quality of GRC shielding concrete. Before they leave the factory, GRC products are subjected to a multi–level inspection, so that their performance parameters do not fall below the strict standards. International ISO 9001 certificate means that the company is continuously improving the solutions offered. Detailed technical data and composition of GRC concrete can be found in the „GRC Knowledge Center” tab. We encourage you to get to know more about GRC Beton products and contact our sales representatives.